A new series of films about digital health innovations in the NHS have been launched, as part of #NHS70DigitalWeek. Produced by the AHSN Network and NHS England, the films show some of the latest ways the NHS is using digital technology to empower people to take control of their health and care. They feature a range of apps and technologies that are starting to be used in parts of the NHS to help people manage conditions in more flexible ways using digital tools and services. 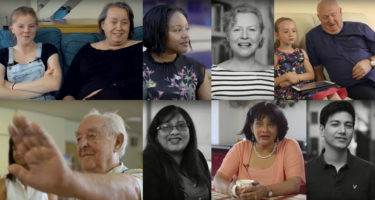 Part of the wider work to celebrate and recognise the NHS’s 70th birthday, the videos aim to prompt people to see the NHS as a digital, as well as face-to-face service. Both the videos and the broader #NHS70DigitalWeek campaign encourage people to visit www.nhs.uk to find out more about how they can engage digitally with their health. “Digital innovation has become an essential part of our everyday life. Whether it is accessing the world’s song catalogue, making immediate connections with friends and family or using maps on our phones to find locations, digital tools have become part of the fabric of our lives and society. The films will be launched once a week over a series of weeks, between 24 July and early September and will be added to this page as they become available. “It’s amazing, it’s the sort of thing you can do when you are commuting.” After having previously been without sleep for several weeks at a time, she reports she now hasn’t had a bad night’s sleep in over a year using this product that is strongly evidenced to combat sleep deprivation. AHSNs have highlighted digital health innovation as a priority area for the NHS in coming years, particularly in the area of long-term condition management, where there are major opportunities for supporting people in self-management and NHS currently spends 70 per cent of its budget. Digital therapeutics work best when there is a partnership between the patient, their GP and where necessary a team of specialist clinicians or coaches supervising results, coaching and encouraging. The results achieved by the best-evidenced products are powerful – weight loss, fewer crises, lower blood glucose, increased activity, better adherence to medicine, improved self-care, better sleep and mood, fewer admissions to hospital and savings in the longer term to the NHS thanks to fewer complications. The AHSNs work to identify and help spread these innovations, supporting innovators from both the NHS and industry, as well as staff within the NHS with uptake, to maximise the opportunities for the benefit of patients.